Alley action from downtown Calgary, Canada. I don’t shoot a lot of alley photos, but I was just walking down this one and noticed the reflection in the water. A few seconds after I noticed the reflection, I noticed that guy walking around the corner and saw he was trying to zip out of my frame. I quickly snapped this shot before he could get out and am I ever glad I did, because I shot another photo after he was gone and it wasn’t nearly as interesting. Also, the guy way the background had moved out of frame right after the first guy did, so the quick shot saved this picture from being a bit of bore :). This entry was posted in People, Street Photography and tagged 50L, 50mm, 5D mark iii, 5D3, 5Diii, Alberta, Alley, Black & White, buildings, Calgarian, Calgary, Canada, canadian, city, City Life, clouds, dude, dweller, garbage, grime, guy, man, men, metro, photo, Photographer, Photography, prime, puddle, Recreation, Recreation and Sports, reflection, sky, skyscrapers, sports, street, trash, Travel, Urban, walking, water, yyc. Bookmark the permalink. 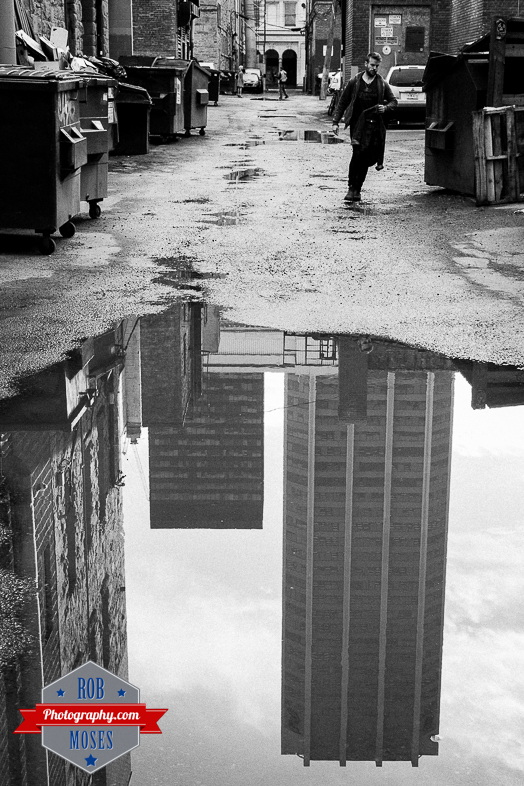 Hi Rob, love the image, I love looking at the reflections in puddles! like you I think having people in the images a good think, they provide action, perspective and scale. thanks for sharing your work with us. Thank you very much 🙂 Glad you like the picture. Great photo: beautiful composition, beautiful tonality, and great energy. I love this shot!!! Just perfect, I think it would be amazing poster or canvas art!!! I love this shot – by far one of my favorites of yours…! Truly brilliant! wow…that is the first thing that came to mind when I saw this photo in the reader Rob…very well done! My eyes were immediately drawn to the reflection, gotta love a reflection, but then to the fellow on the right. I have to say I wondered what he was running from…I didn’t think he was trying to avoid having his photo taken, I was wondering if the reason was sinister??? 😉 sinister is the feeling I get from the rest of the alley…love the photo! Thank you Heather . But he was indeed trying to get out of the frame, not because he didn’t want his picture take’n, but I think he was just trying to get out of my way. Little did he know he was to be a big part of the shot haha. I thanked him after words for his effort in moving though ;). Isn’t it interesting how different people see things differently? Great shot regardless, definitely something that could be a print! Interesting indeed :). Thanks again Heather! I might just have to print this one out. Great work Rob! Love the black and white. Adds a nice dynamic to your image. Gorgeous B&W shot. Quite a fan of the urban puddle reflections!